Can you believe that we are talking about Valentine’s Day…wasn’t Christmas just here? 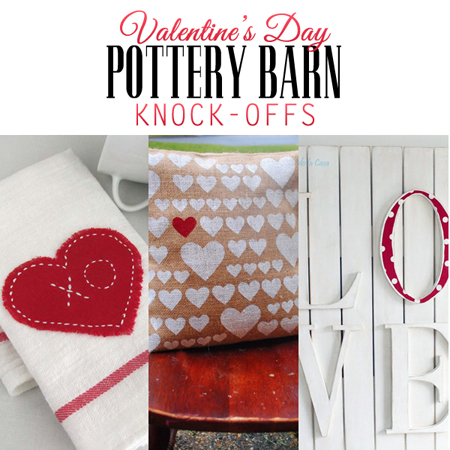 Well it’s on the way so I thought I would give you a head start to your decorating DIY Projects with this little collection of Valentine’s Day Pottery Barn Knock-Offs! You will really enjoy this selection…you will find pillows that you can use all year round…dish towels that are so adorable you will never want to put them away for next year, you will just want to have them out all the time! Then there is a piece of wall art that you are going to LOVE …literallly…it is one of my favorite projects… a fun piece of XOX wall art or shelf sitters that are made from wooden wrapped letters and a wreath O…you have to see it…looks like it walked right out of Pottery Barn! Then there is a Felt DIY Envelope that is over the top adorable… it hangs on the back of the chair and is ready for all those Valentine’s….I think it is even more fabulous then the original! 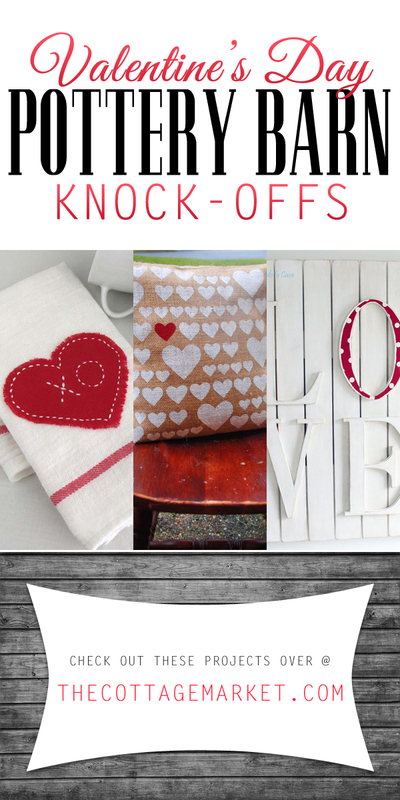 So if you are in the mood to add a bit of love themed to your home decor…check out this collection and your heart will beat just a little quicker then before! The cool thing about all of these Pottery Barn Inspired Projects is that they truly can stay out all year long…but on the flip side…you can take them out with that special anticipation each year also! All can be done in an afternoon and that makes them close to the PERFECT DIY! As always here at The Cottage Market we would like to send out tons of APPAWS and APPLAUSE to all of our blogger friends for sharing their talents and creativity with us! We want them to know that they are appreciated and loved. You are going to adore exploring their blogs for more outstanding DIY’s and inspiration. As always…ENJOY & CREATE!